Why the images upload so small, I do not know, but it sure is irritating. This wishlist is a bit random, and some items are unrealistic and I only dream of owning whereas some are pretty certain going to be bought. 1. Cambridge Satchel. Unrealistic need of mine. I have really started to warm to the bright pastel colours they are starting to bring to the summer collection. I think with a dull, boring outfit, if you had one of these bags the outfit would be made. I paired the images with the classic black satchel too, because I would love both a coloured one and a black satchel for a more vintage, classic look. At a hefty £90 odd for the real deal I will not be investing in one of these beautys any time soon, but I can admire from a far and hunt down some cheaper version. 2. Ok so this black fringed bag is more realistic and perfect for when summer comes along. I found this on ASOS for £48 which is still a lot, but I'm sure these style bags are going to be appearing everywhere again soon I hope. Fringed bags for a cool and casual summer look paired with some shades is the way to go. 3. Matrix So Silver Shampoo. I have been using this shampoo for a while now but ran out a few weeks ago. I usually order it online for around £8/9 or pick it up from a hairdressers when I can. I am in desperate need of getting it again because my hair is going so brassy/yellowish again, argh. This shampoo comes out bright purple and its aim is to reduce unwanted yellow tones from hair. When I use it my hair feels more lighter instantly and less of that tacky yellow blonde colour that comes through after a while, (blonde problems). Sometimes I just lather my hair in it when its dry and leave it for about 20 minutes then wash it out because it's a toner based product as well as a shampoo. Condition excessively though as it really drys up your hair if you don't!. 4. Motel Savannah Cold shoulder dress in black from Motel Rocks. I really love this dress, and its shapelessness and the shoulder cut outs. For a night out it would be perfect. It has this cool, laid back vibe to it for a night time dress which I love. 5. Ray-ban frames. I need to wear glasses for studying, reading, driving....but I never, ever do. I just do not like my glasses and I believe if I owned some more stylish ones like these then I would start to wear my glasses. It's that simple! 6. iphone 5. My contract ends in August and it will be goodbye HTC and hello iphone hype. Lets be honest they do look so much better in appearance and in white especially, but to be honest I will get a gorgeous phone case for it anyway. Hurry August. 7. Pretty pastel nail colours. I have been after some new refreshing nail colours for a while and I really like oranges, mint greens and blues. I was always a fan of dark nails and red nails but I think it was more of a 'it's winter' thing. Undecided weather I will actually go for BarryM, I think if I just see a nice colour and heard some good reviews then I will go for something else. 8. Very old 1920's Vogue magazine articles. Probably very unrealistic. My University library dates them back to the 1950's but for my research for my dissertation I really need copies of the twenty's. This is going to be some future research of mine, and I will probably have to pay some ££ to get hold of anything. Can you believe it used to look like that though? Very more artistic then now! Google image 1920's Vogue magazines and you will see so many old designs they used to do. Love it! 9. Just fashion jewelry in general. I seem to have been over wearing the same usual pieces and I need to stop. I like the bar collar necklaces they are doing at the minute though like the image above that is from Topshop. 10. MAC makeup, in particular the lipsticks and foundation. Reasons why are firstly I hear too many good reviews on the lipsticks. Secondly, the foundation I usually use - Maybelline dream satin liquid is a perfect foundation for drugstore makeup, but lately I have been wanting more coverage and so I think maybe I need to start paying the price? Anyone know any other good covering, long lasting foundations, please leave a comment. Thanks for listening to my wishlist rambles. Love to hear what others are wishing for lately. How gorgeous are the Cambridge satchels! I think I would just purchase a copy one though, they are way overpriced in my opinion! Still gorgeous though! I love the BarryM shades!! Thank you for the comment on my blog, i have followed you now, it would mean a lot if you maybe followed me back:)? I really want a satchel too but its just too much to pay! Also I just found your blog & I go to the University of Lincoln too! Haha. What do you study? I really need new glasses too! 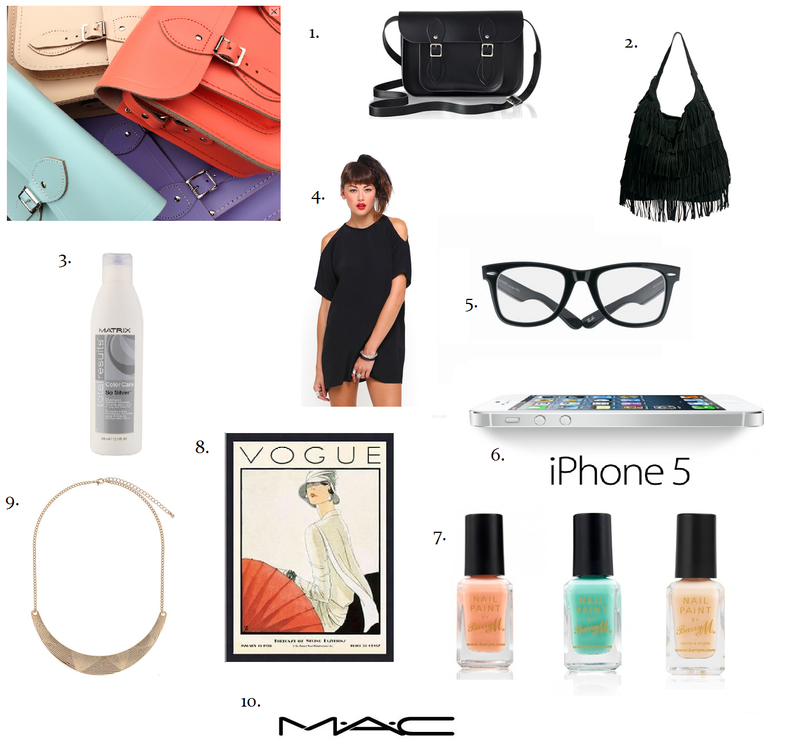 And an Iphone 5 and a Satchel and almost everything on your list!